Land Rovers are lovely, Jeeps are cool and International Scouts are obviously sweet. But the Toyota Land Cruiser is, always and forever, the gold standard in off-road capability and rough-country survivability. Getting one to pass 220 MPH is pretty far out of its wheelhouse though. 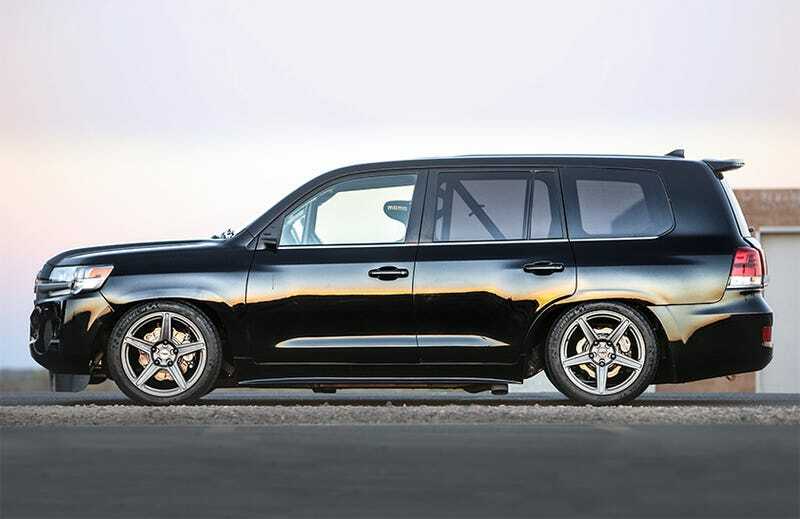 For the occasion of the 2016 SEMA show, an annual gathering of lights and lunacy where the automotive aftermarket industry goes to sword-fight with its latest wares, Toyota has created the Land Speed Cruiser. It’s awesome when a corporation has a sense of humor and a savvy engineering team. And a bottomless budget. The SUV’s standard Toyota 3UR-FE 5.7-liter V8 has been dialed way up with two Garrett turbos the company officially describes as “the size of volleyballs” for a claimed output of “more than 2,000 horsepower.” This engine, used in the Tundra, Sequoia, LX and GX is normally rated to 381 hp in a Land Cruiser like this. Today’s Cruiser also weighs 5,765 pounds, but it looks like this one’s gone on at least a little diet based on the interior images in that video. A custom-made transmission puts that power down to massively wide wheels, which required the whole truck’s track to be narrowed by 3 inches to fit. Toyota is already calling this “the world’s fastest SUV” with a claimed top speed of 220 MPH, but it appears as though the actual record-setting run is still on the horizon. I do believe the 187 MPH Bentley Bentayga is technically today’s fastest SUV from the factory, that being just a hair ahead of the Porsche Cayenne Turbo. As for modified stuff like this Land Cruiser– “records” and “the defintion of what is still an SUV” gets a little murky. Last I heard, the “true” record was set in 2009 by a Brabus-tuned V12-swapped Mercedes-Benz GLK at 200.3 MPH. Think two big honking turbos is enough to smoke that little guy?